Today’s workforce is full of people who are looking for their job to be a source of fulfillment. Finding meaningful work isn’t a new desire that’s unique to younger generations, but the opportunities to do so are more abundant than they’ve ever been. Statistics like that make it clear that a “good job” these days needs to include training and career advancement opportunities. Providing those opportunities is one thing, but making them engaging for a modern employee is a trickier task, as it requires continual change. Many people have a negative attitude toward corporate training these days because it connotes taking lengthy courses that aren’t engaging and often aren’t relevant to the job at hand, therefore don’t result in new and valuable skills being learned. When a company spends a lot of time and money investing in a training program, it’s tempting to stick with that program for years to come, even if it isn’t adapting to learners’ needs or proving effective anymore. This is why many organizations are behind when it comes to moving toward a learner-centric training strategy. If training is focused on fulfilling the company’s needs, but fails to address the priorities of its employees, the program quickly loses ROI and employee development stalls. That’s a place no company wants to be – without employees learning what it takes to do their jobs well now (and in the future! ), business growth will become a remnant of the past. Engaging employees in training is a necessity to build a business that is agile, ready for change at the drop of a hat, and competitive in the market. Providing training that yields those results requires adapting to the changing needs of the workforce, and creating a culture where learning is possible every day. If your company is struggling to build this kind of culture, where training and development are a top priority when it comes to budgeting money, time, and resources, then it’s probably true that you’re also struggling with engaging employees in the ways that they value most. Showing them that you’re invested in their development is the best way to build a team that is talented, smart, productive, and forward-thinking. The best options for investing in training are those that are going to grow right alongside your employees – they aren’t static solutions that are constantly behind the learning curve. One of the main ways that technology has caught up with employees’ training needs is the ability to make it a more personal experience, on a larger scale. Tutoring and apprenticeship are highly effective methods of learning because they cater to the needs of each individual learner. Although that kind of 1-on-1 model isn’t feasible for most companies today, currently available and emerging training technology makes it possible to deliver more customized training than the classrooms of decades past. Your employees don’t fit a particular mold when you take into account all of their previous education, work history, and life experiences. The training they need for compliance, their specific job role, and professional development will be most effective when it falls in line with their individual knowledge and experience. Self-directed learning is on the rise, thanks to libraries of content that address the many skills employees need on the job, no matter what industry they’re in. Video content libraries with advanced filtering options give individuals the opportunity to find specific content that teaches a skill they need at that exact moment. They provide ongoing training anytime, anywhere. Time has always been a precious resource, but even when training is a high priority, it can be a struggle for employees to make time for learning each day, let alone each week or month. That’s why microlearning is becoming more and more popular as a training method – providing short videos (less than 10 minutes) allows skill-building to happen on a regular basis, rather than being relegated to only a classroom setting, or when large chunks of time can be set aside for training. With career development being a top priority in the eyes of your team, and considering the vast array of benefits it brings to the company, it’s in everyone’s best interest to promote self-directed learning through a curated content library. An important component of a high quality video content library is how well it adapts to the changing needs of modern learners, giving them more control over their own learning pathways, while helping training administrators to provide more personalized development. The emerging technology in adaptive learning is setting out to improve the efficiency of training by keeping employees focused on learning what they don’t already know. Algorithms that record course completions and answers to questions can set learners on a fast track to building their chosen skills, and understanding how they relate to other skills that would be useful for them. This technology can continually adapt the training to create the more learner-centric approach that is desperately needed in today’s employee training programs. Tracking the skills people already have and then providing learning opportunities that are tailored to improving those skills allows employees to become experts in their field much faster than traditional, classroom-based training. That customization will not only make training less time-consuming, but it’ll make it more engaging when an individual is constantly challenged to learn the skills relevant to their job now, and where their career is headed in the future. When you’re evaluating how to improve employee engagement in your organization, take a critical look at how your training efforts are providing self-directed learning opportunities. Have you adapted to the need for training in the moment through microlearning? Does your technology provider have a history of adapting their training solutions to a more learner-centric strategy? Are their clients seeing better business results through employees who are more engaged in developing themselves at work? These are the kinds of questions that will help your organization stay ahead of the training curve, which translates to a higher-performing workforce and a more agile company. 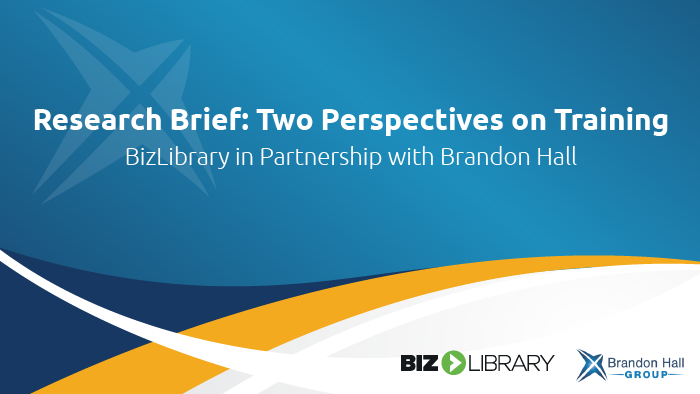 To learn more about how organizations are transitioning to more engaging employee training methods, download the 2017 research report from The Brandon Hall Group and BizLibrary.